Rose Bridger on the threat of an aerotropolis on Jeju Island. 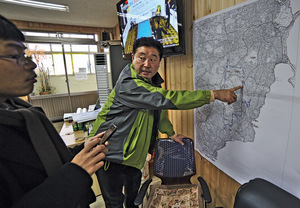 The mayor of Sinsan village points out a map of the proposed air city development on Jeju island, and its negative consequences for locals. The prospect of a major new airport on the South Korean island of Jeju has been poorly received by many who live there. The planned airport, described as ‘the largest project in the island’s history’ by Jeju Governor Won Hee-ryong, is the hub of a proposed ‘AirCity’ megaproject – or ‘aerotropolis’ – comprising shopping malls, convention centres and financial complexes. It’s designed to drive aviation growth on this pristine volcanic island, whose beautiful beaches make it a popular destination with holidaymakers. After the plan was announced in November 2015, residents of five affected villages, who fear being evicted from their homes and farms, strung banners and flags of protest along 20 kilometres of local roads. The provincial government paid no heed, hanging its own banners in Jeju City which proclaimed ‘Second Airport Plans Confirmed’. Village representatives dispute this, saying they were not consulted about the project and pointing out that the plan has not received the requisite government clearances. Hundreds have taken part in demonstrations and campaign leaders have vowed to continue the fight. Jeju’s residents have form in resisting unwelcome development. The planned construction of a naval base at Gangjeong on Jeju’s southern coast has encountered fierce opposition from environmental and peace activists who have engaged in nonviolent direct action, blocking bulldozers and equipment deliveries to repeatedly stall construction (see Agenda, NI 453). Some predict an even greater protest movement if the new airport goes ahead. Governments and corporations all over the world are pursuing such aerotropolis projects. Large sites are being allocated, and, in many cases, as in Jeju, the schemes bring the threat of destruction of farmland and ecosystems and the displacement of people. In March 2015, the Global Anti-Aerotropolis Movement (GAAM) was formed to support these local struggles and build an international campaign community. It reports worldwide protests, notably in Bhogapuram in the Indian state of Andhra Pradesh and Kulon Progo in Indonesia, as well as in Istanbul and Kilimanjaro airport in Tanzania.